Medium Functional Bird Cage an innovative design, medium, single height, practical bird cage. Comes with a door that opens on two sides can be turned inward and the debris guard helps keep mess inside the cage. Deep base with debris guard to keep mess inside the cage. 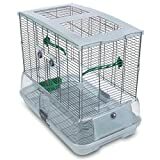 Equipped with food and water bowls and green perches that accessible from outside the cage. This entry was posted in Birds and tagged Bird, Budgies, Cage, Canaries, Finches, Height, Lovebirds, Medium, Practical, single, Suitable, Vision, White by One Boutique. Bookmark the permalink.